Samsung Galaxy Note 3 is one of the most anticipated smartphones in 2013 and rumour mills by industry insiders say that this model won’t get released till September. In spite of this, numerous hints pull away the veils of the new Samsung smartphone. It’s said Android 4.2.2 Jelly Bean or the soon-to-come 4.3 OS will be used to power the new flagship. Other purported specs on this device include a 5.9 inch Full HD display with a 1920 x 1080 pixel resolution, along with 8-core Mali 450GPU. Wanna Play DVD Movies on Galaxy Note III? Attributing to the super large and FHD screen, Galaxy Note 3 cannot be too good to watch DVD movies thereupon. Nonetheless the down side is Samsung development teams still don’t build DVD ROM in this hot gadget, leaving a lion in the way if you want to play DVD movie on the mobile device directly. But this doesn’t mean you cannot achieve this goal. There are silver linings. You can rip DVD to Galaxy Note 3 viewable video format beforehand so as to access your converted movie to this Samsung gadget without limitation. In order to fulfill the DVD conversion task, you need to prepare a piece of high-end DVD ripper software, such as MacX DVD Ripper Pro that is especially designed for Samsung Galaxy devices. It acts as a high-caliber DVD decrypter that emancipates DVD movie from the confine of copy protection schemes like CSS, Region Code, Sony ARccOS, etc. This software also works as a DVD ripper for Galaxy Note, capable of liberating movie content from DVD and making it playable on your Galaxy Note 3/2 in a few clicks. The sticking point is that this tool allows Samsung followers to rip DVD to Galaxy Note III/II, Galaxy S4/S5/S6/S7 and other Samsung gadgets effortlessly with intact quality. Tips: MacXDVD provides both Mac version and Windows version. 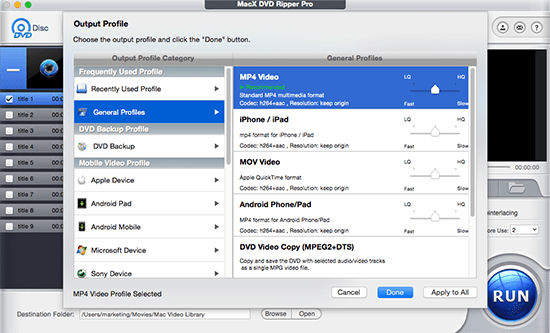 For Mac users, please download Mac DVD ripper to suit your needs; for PC users, you can choose Windows version to rip DVD DVD to the new gadget. Kick off this DVD ripper for Galaxy Note on Mac, click "DVD" button to import source DVD disc. After loading the DVD, choose Galaxy Note as the output profile in Output Profile Category. Hit Android Mobile -> to Samsung Mobile Video -> Samsung Galaxy Note 2/3 -> Press Done. Hit the "RUN" button to start ripping DVD. After a period of conversion, you can import and play DVD movie on your Galaxy Note 3 anywhere anytime. MacX DVD Ripper Pro makes regular update to keep pace with the change around mobility. Its latest version has a good many 300 profiles, which not only helps to rip DVD to MP4, MOV, FLV, AVI, MKV, WMV, but also enables to convert DVD to all the latest mobiles and tablets including iPad Mini, iPhone 5, Galaxy Note 3/2, Galaxy S4/3, HTC One, Kindle Fire, Google Nexus 7, PSP, Xbox, etc. Therefore, you will be not restricted by your device you have in watching DVD movies. Note: The best Mac DVD ripper developer calls for ripping or copying DVD under the concept of Fair Use and does not encourage any illegal reproduction or distribution of copyrighted content. Please abide by the local DVD copyright law. Wanna watch DVD movies on mobile phone? This tutorial shares you a detailed and easy solution to rip DVD to mobile phone and play DVD movies on Galaxy Note/S4, HTC One, Nokia Lumia, etc with a couple clicks. This article introduces a review of the best DVD ripper for Android and tells you how to rip DVD to Galaxy Note 3, Galaxy S4,HTC One, Kindle Fire, Google Nexus, etc easily. Wanna play DVD movie on BlackBerry? This tutorial is about how to rip and convert DVD to BlackBerry P'9981, Q10/Z10, Bold 9900/9930 in a snap with the best DVD to BlackBerry ripper.